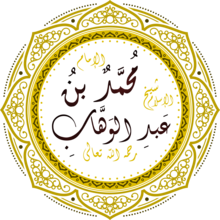 اسلامي دنيا ۾ ھڪ ناليوارو مذھبي عالم جيڪو 1703 ۾ عربستان جي علائقي نجد جي شھر العيينه ۾ فقه جي عالم عبدالوھاب جي گھر ۾ پيدا ٿيو ۽ 22 جون 1792 ۾ وفات ڪيائين. ھن مشھور وھابي تحريڪ جي شروعات ڪئي. ↑ Laoust, H., "Ibn Abd al-Wahhāb", in: Encyclopaedia of Islam, Second Edition, Edited by: P. Bearman, Th. Bianquis, C.E. Bosworth, E. van Donzel, W.P. Heinrichs. ↑ Moosa, Ebrahim (2015-04-06) (en ۾). What Is a Madrasa?. UNC Press Books. pp. 97. ISBN 9781469620145. https://books.google.com/books?id=ei9ZBwAAQBAJ&pg=PA97&dq=Ibn+Abdul+Wahhab+reformer&hl=en&sa=X&redir_esc=y#v=onepage&q=Ibn%20Abdul%20Wahhab%20reformer&f=false. ↑ White, Jonathan R. (2016-01-01) (en ۾). Terrorism and Homeland Security. Cengage Learning. pp. 252. ISBN 9781305886940. https://books.google.com/books?id=XL8aCgAAQBAJ&pg=PA252&dq=who+is+Ibn+Abdul+Wahhab&hl=en&sa=X&ved=0ahUKEwiRg4a9jPnQAhUMIMAKHWM8B2I4HhDoAQggMAE#v=onepage&q=who%20is%20Ibn%20Abdul%20Wahhab&f=false. ↑ Hubbard, Ben (2016-07-10). "A Saudi Morals Enforcer Called for a More Liberal Islam. Then the Death Threats Began.". The New York Times. ISSN 0362-4331. https://www.nytimes.com/2016/07/11/world/middleeast/saudi-arabia-islam-wahhabism-religious-police.html. ↑ Asad, Talal (2003-02-03) (en ۾). Formations of the Secular: Christianity, Islam, Modernity. Stanford University Press. pp. 222. ISBN 9780804747684. https://books.google.com/books?id=CeJ85XwCPxQC&pg=PA222&dq=Ibn+Abdul+Wahhab+reformer&hl=en&sa=X&redir_esc=y#v=onepage&q=Ibn%20Abdul%20Wahhab%20reformer&f=false. ↑ ́goston, Ga ́bor A.; Masters, Bruce Alan (2010-05-21) (en ۾). Encyclopedia of the Ottoman Empire. Infobase Publishing. pp. 260. ISBN 9781438110257. https://books.google.com/books?id=QjzYdCxumFcC&pg=PA260&dq=Ibn+Abdul+Wahhab+reformer&hl=en&sa=X&redir_esc=y#v=onepage&q=Ibn%20Abdul%20Wahhab%20reformer&f=false. هيءُ صفحو آخري ڀيرو 16:43، 4 نومبر 2018ع تي ترميميو ويو هو.